On Tuesday, the same day that the Supreme Court issued its decision firmly upholding Michigan's 2006 civil rights initiative prohibiting racial preferences in university admissions and public-sector employment and contracting, the court also heard arguments in a critical political speech case originating in Ohio. Ultimately at issue is the section of Ohio's Revised Code involving "false statements in campaign materials." The Cleveland Plain Dealer estimates that "at least 15 other states have similar laws." The case's plaintiffs, the Susan B. Anthony List, a prolife organization, and COAST, a group of Greater Cincinnati limited-government activists, want the entire law thrown out. In his final rebuttal Tuesday, SBAL's attorney stated: "We want to say that anything, fact or opinion, is unconstitutional to limit under the false statement law." To be clear, as COAST attorney Christopher Finney reminded me in a Friday morning conversation, the Supreme Court's decision in the case will only directly relate to standing, i.e., whether SBAL and COAST have the right to bring legal action. That said, the justices' necessarily narrow ruling may also yield clues as to their feelings on the underlying matter. The free-speech tide is clearly running in the plaintiffs' direction. In 2012, the court, in U.S. vs. Alvarez, ruled that a 2005 federal law which criminalized false statements about one's military service and honors was unconstitutional. If there is no legal recourse against people who publicly and obviously lie about their military honors or other aspects of their military service, or even about whether they served at all, then what constitutional basis is there for laws which attempt to curb or sanction even blatantly false statements by political candidates and their supporters? Despite the plaintiffs' prolife and conservative politcal positions, the American Civil Liberties Union is among the many groups which filed an amicus brief on their behalf. Finney also noted that certain court members sent clear signals in oral arguments during Alvarez that they have little regard for non-libelous false statement laws in general. 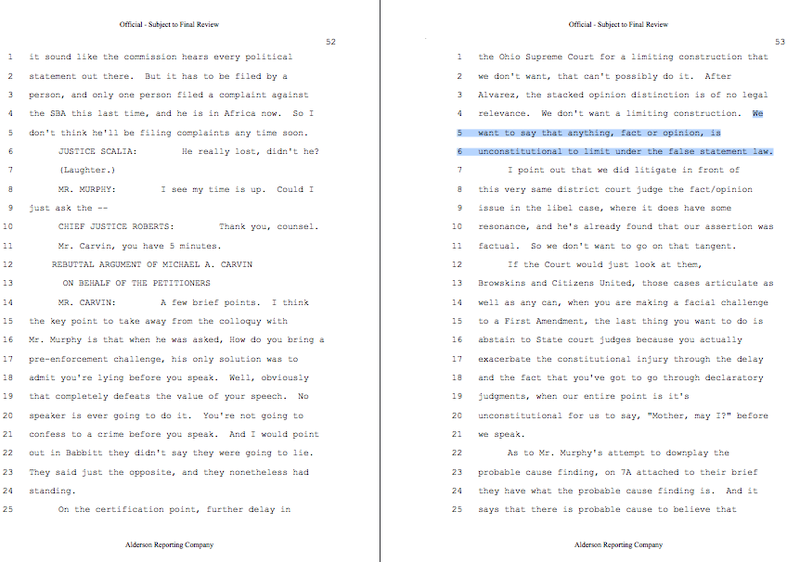 On Tuesday, SBAL argued, and a clear majority of justices seemed to agree, that a 2010 pre-election "probable cause" false statement finding by a panel of the Ohio Elections Commission, the state body formed to hear and adjudicate complaints under the law, sufficed to show that its free-speech rights had been abridged. SBAL had sought to put up billboards claiming that incumbent First District Congressman Steve Driehaus's vote for the Affordable Care Act earlier that year constituted support for taxpayer-funded abortions. Billboard companies refused SBAL's business as a result of the finding. COAST joined the action because it had been ready to publicly push the same argument until the OEC panel's finding. The state of Ohio, in defending its law, has argued that since the full OEC hadn't formally ruled, no actual harm had occurred. The full OEC never heard the matter, because Driehaus did not pursue his OEC complaint after losing his reelection bid. Instead, he opted to sue SBAL for defamation and — get this — "loss of livelihood." This gambit progressed through the legal system much further than it should have before ultimately failing in early 2013. SBAL's abortion-related assertion relating to Driehaus's ACA vote has since been vindicated. In the matter before them, it appears overwhelmingly likely that the Supremes will throw out the state of Ohio's no-harm argument, and that SBAL and COAST will prevail once the matter returns to the lower courts. Is all of this for the good? I hope so, but I have my doubts, to a large degree based on my observations of the deteriorating integrity of political parties, candidates, and campaigns — a problem which is far more prevalent on the left than on the right. Throwing out Ohio's entire law would incorrectly and I believe dangerously concede a cherished point of the deconstructionist left, namely that there is no such thing as a univerally agreed-upon fact. Section (B) of Ohio's law prohibits ten categories of false statements. Nine of them are specific. In an ideal world, I would keep at least a few of them, while limiting the punishments involved to fines. The tenth, which prohibits "disseminat(ing) a false statement concerning a candidate, either knowing the same to be false or with reckless disregard of whether it was false or not," is a catch-all, and should indeed be thrown out. This treatment would provide SBAL and COAST the relief they seek while still deterring a few of the most egregious campaign tactics. To illustrate, let's look at the opening section of the law's first specific prohibition. It states that a candidate shall not "use the title of an office not currently held by a candidate in a manner that implies that the candidate does currently hold that office." In 2005, Bob McEwen, one of 11 Republican primary candidates in a special congressional election free-for-all brought about by then-Congressman Rob Portman's decision to accept an appointment as President George W. Bush's trade representative, began running TV and radio ads and distributing literature referring to him as "Congressman McEwen." Bob hadn't been in Congress for over a dozen years; voters fired him in November 1992, primarily because of his involvement in the House banking scandal.